Adventure into the desert of Canny Valley and explore Thunder Route 99... Immerse yourself in the story, uncover its secrets, and explore the new Arid Biome with your friends. 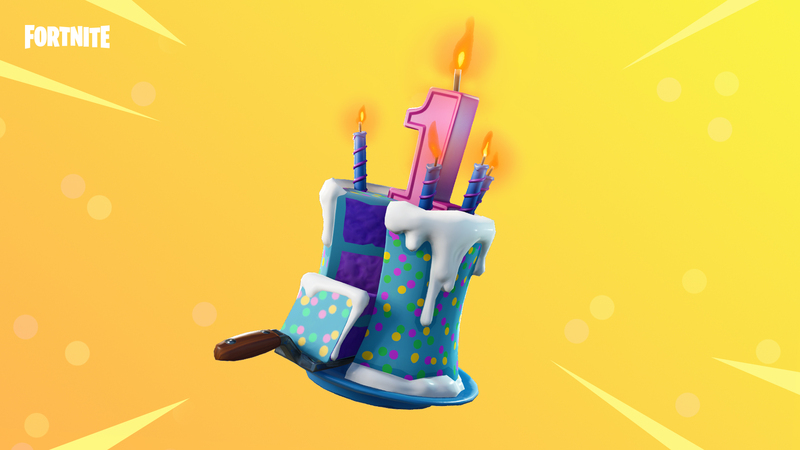 Celebrate #Fortnite1st with cake, loot, and a special in-game questline. Complete the questline to unlock Birthday Brigade Ramirez. 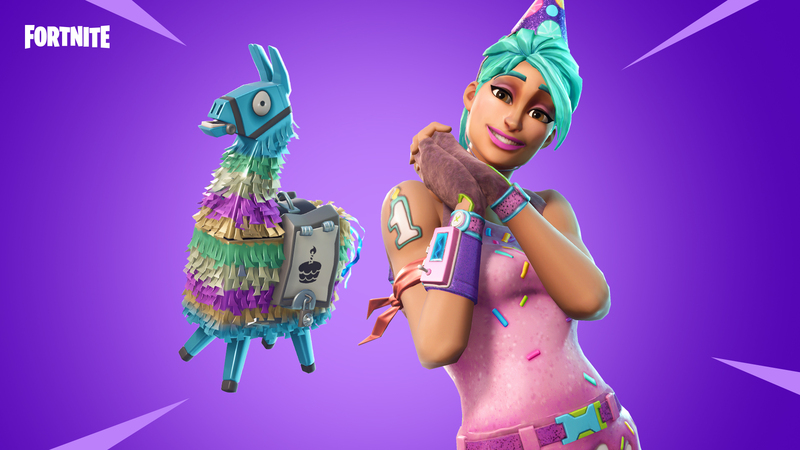 While you’re partying, find and eat birthday cakes to earn event tickets which can be spent on the limited time Birthday Llama. New default keybindings for new players. All keyboard layouts will continue to default to the QWERTY bindings for new players or those who reset their back to default. Changed the background of the loading screen bullet points area to be partially translucent. Removed the “static noise” when switching tabs. The “Restore” button has been removed from the settings screen. Also, the “Reset Defaults” button has been renamed to “Reset”. Leaving the settings screen before applying changes will give the option to apply changes and exit or discard changes and exit. Items on the ground will properly have their stack counts updated if the stack size changes while the player is currently looking at them. Fixed a frame delay on some text layouts, which would cause large blocks of text to reflow their wrapping one frame after seeing them. Corrected text shadows that were appearing incorrectly in certain areas of the UI. Complete three birthday event challenges to unlock a new emote, spray, and Backbling. Playground is a low-pressure environment where friends can let their creativity run wild. Build massive structures. Practice with the weapons and items. Fight against your friends. This mode returns with improvements for a limited time on Wednesday, July 25. Have fun! Drop into the Battle Royale map alone or with up to a full squad for an hour. Players respawn immediately unless eliminated by the Storm. The Storm doesn't start closing in for 55 minutes and takes 5 minutes to close in. Resources gained from harvesting increased by ten times the normal amount. Slurp Juice now grants 1 health every 0.5 seconds, up to a total of 75. If health is full, shield will be granted instead. Minigun to 10.42% from 14.2%. Launch Pad to 44.44% from 9.6%. Cozy Campfire to 33.33% from 7.5%. Wood to 33% from 47.6%. Stone to 33% from 35.7%. Metal to 33% from 16.6%. Wood wall starting health to 80 from 100. Stone wall starting health to 80 from 90. Wood wall max health to 150 from 200. Metal wall max health to 500 from 400. Metal build time to 25s from 20s. Safezone 2 wait time to 120 from 150. Safezone 2 shrink time to 120 from 90. Safezone 4 wait time to 90 from 120. Safezone 6 wait time to 60 from 90. Safezone 7 wait time to 45 from 60. Safezone 8 wait time to 30 from 60. Safezone 9 wait time to 30 from 45. Added moving circle to Safezone 6. Added "Sprint By Default" option, when enabled this makes sprint the default movement. The sprint key will now be used to transition into walking. Newly-placed building pieces will now appear in a different color while players are still overlapping the structure. Improved handling of collision when building pieces are placed right on top of a player. It's much more likely for players to be moved outside of newly-placed structures. 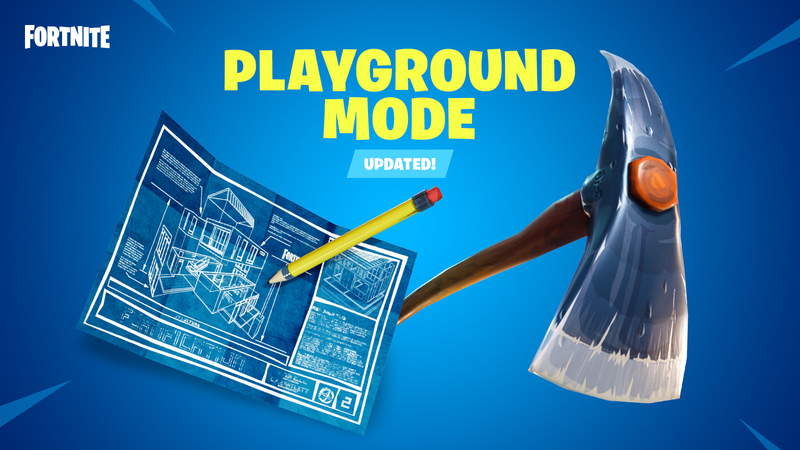 Pickaxe damage against enemy and ally player built structures increased to 75 base damage and 150 critical damage. The slow motion and confetti effects for a Victory Royale will now play for the winner regardless of how they win the game. Changing the gyro motion of the Nintendo Switch to rotate around the roll instead of the yaw. This is intended to allow for the users to be able to hold the device in any situation and always have the motion react according to the screen direction instead of being in the Switch's world space. Autorun can now be used while in vehicles. Fixed a logic issue in the autorun canceling code. This should also fix autorun canceling when releasing the stick while using a gamepad. Changed the button layout for Old School and Quick Builder configs so that the “change seat” action button is not the same as the “powerslide” button. Players will no longer get stuck in the coasting state if they change seats while in a vehicle. Pickaxes will no longer stretch and appear incorrectly if the slow-motion effect plays while players are riding in a vehicle. Players will no longer hold weapons while emoting if they’re riding in an All Terrain Kart. Players will no longer fall through floor or pushed through walls when placing or editing structures. Remote Explosives will now only show damage numbers when damage is done to players. Vehicles can no longer be flipped while standing on top of them. This fixes the issue where players would sometimes become stuck or teleported if standing on a vehicle that flipped. Crouching is no longer allowed while emoting. The Wave emote, emoticons, and sprays will now continue to play even if you’re moving. Various server performance improvements focused on the 50v50 LTM. Server performance improvements were made to the custom matches used during competitive events. Significant All Terrain Kart (ATK) performance improvements. Added spatialization to the sound played when a marker is placed on the map. Now you will hear it coming from where the in-world marker was placed. Improved All Terrain Kart (ATK) audio attenuation fall-off. Added a unique sound when the All Terrain Kart (ATK) is destroyed. Added sounds for when the All Terrain Kart (ATK) is in water. Improvements have been made to grenade bounce audio so they don’t sound as spammy under certain conditions. Lowered the volume of the AC/DC pickaxe. Added a unique sound for bouncing off a diving board. Added a unique sound for destroying cacti. Audio panning logic for Switch has been changed. Sources panning from one side to another will be more dramatic. Twist emote music no longer overlaps with other emote music. Re-added metal impact sounds when shooting or pickaxing Shopping Carts. Weapon fire audio no longer cuts out when low on ammo for some weapons. Adjusted lobby nameplate arrangement to better account for long player names. Added the ability to combine stackable items in player inventory if the stack sizes aren't already capped. Fixed an issue preventing players to select nothing as an Outfit and Backbling. Removed the ‘Save and Exit’ option for items without variants. Double tap the accept hotkey/button to confirm your selection. Fixed an issue in the locker where the shuffle icon for randomized outfits was drawn slightly differently to other shuffle icons. Removed an error message when trying to purchase the Battle Bundle while at tier 76 or above. The correct actions are now shown on the HUD when you get into a Shopping Cart for the first time after being in an All Terrain Kart (ATK). Prevented sprays from affecting the eyes of the Rainbow Smash pickaxe. The Toilet Paper contrail animations now appear correctly. Changed the icon when a player has been downed to an exclamation mark. Battle Bus positioning now appears correctly in replays. Fixed an issue with focus distance when changing cameras in replays. Fixed issues with drone cameras when viewing players in vehicles during replays. Fixed an issue where the camera controls would not display when toggling the HUD visibility. Downloading patches will now continue when you switch to a different app. When the download has completed, you’ll receive a notification. Fire mode selection now has preview videos to better illustrate the functionality. Added new placeable individual quick bar buttons to the HUD layout tool. Can be set to either locked Combat, locked Build, or Automatic mode to switch based on the player’s currently selected mode. Tapping a currently selected build item from the quick bar will now build the item. Fixed texture streaming issues with the battle bus. Audible pops will no longer occur on iOS during loading screens and gameplay. These new quests continue the storyline into Canny Valley and will appear on the quest map. All players with access to Canny Valley and Twine Peaks will be able to complete this new storyline. Storm Shield Defense and Launch the Rocket quests are unchanged and are still required to unlock new difficulties within Canny Valley. You can now advance directly from one Storm Shield Defense to the next, without doing every story quest in between. Old Canny Valley quests are still present and have been converted into a series of optional side quests. Dupe Prevention added to ALL Llamas! After the Llama has determined the rarity and type of drop (IE - an Epic shotgun, a Legendary event hero, etc) it will select an item from that category that is not already in your inventory or Collection Book. This change applies to Epic, Legendary and Mythic schematics and heroes. You can now advance directly from one Storm Shield Defense to the next, unlocking new areas without doing the quests in between. New quests have been inserted into the Twine Peaks main questline that require completion of the Storm Shield Defenses and give retroactive credit. The leader of your party must be at or above the Required Power Rating before your party can join a Mission of the listed recommended Power Rating. This requirement applies to Mission Alerts as well as normal missions. It does not apply to Storm Shield Defenses. Find and eat Birthday Cakes to earn event tickets. Eliminate Cake Sploders to earn a Birthday Hero. We’ve begun implementing a new system for mission activation and voting. For now, we've added it to Retrieve the Data and Ride the Lightning missions. This new system replaces the Difficulty Pylon in the world and allows for both mission start and difficulty increase at the mission location. In games with more than one player, increasing difficulty requires a majority vote. In Ride the Lightning games with more than one player, starting the mission before the mission ready timer has expired also requires a majority vote. The default time for mission ready is currently set to 10 minutes. 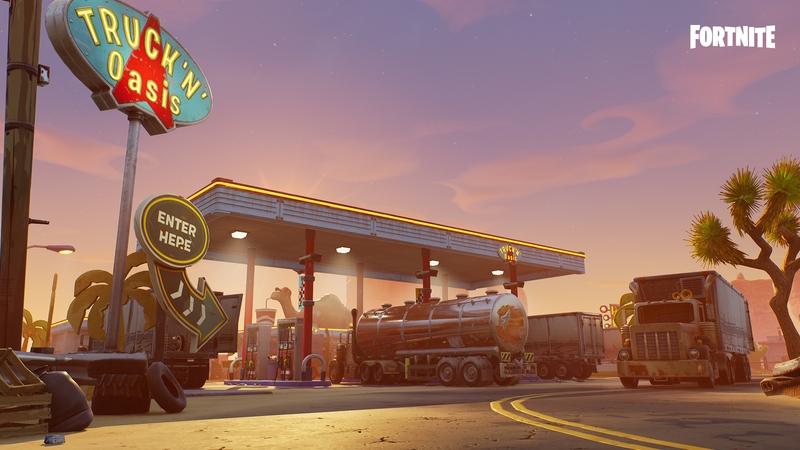 Ride the Lightning mission will now show the storm direction on locating Lars's van instead of on depositing BluGlo. Birthday Brigade Ramirez, Legendary variant of Sergeant, is available from the limited-time birthday quest. New Mythic Constructor: Steel Wool Syd, has been added to the Act 1 Canny Valley questline. New Subclass: Kinetic Beats - Steel Wool singer that uses hardware to drop kinetic beats. Software - Increases hardware heavy attack energy efficiency by 150%. Lightweight - Increases hardware attack speed by 24%. Maximum Overload - Increases damage of Kinetic Overload by 110%. Available July 25 at 8PM Eastern Time (July 26 at 0000 GMT). Collision has been removed on Plasma Pulse for other players. Changed wording in Hammer specific abilities from "Blunt" to "Hammer"
Base M.D. now heals for the correct amount. The Base M.D. tooltip has been corrected to show "The Constructor's BASE regenerates 30 health every 3 seconds while allies are inside." The Tail of the Dragon tooltip has been corrected to show "Dragon Slash leaves a persistent trail of energy, damaging for 12% of Dragon Slash damage, every 0.5 seconds, and slowing enemies by 30% caught within the tail for 3 seconds." The tooltip for Corrosive Stars has been corrected to show "Throwing Stars Afflict their targets, doing 25% of Throwing Stars damage every second, for 6 seconds." The tooltip for Nice and Slow has been corrected to show "Kinetic Overload applies a 40% slow to affected targets, reducing their movement and attack speed for 5 seconds." 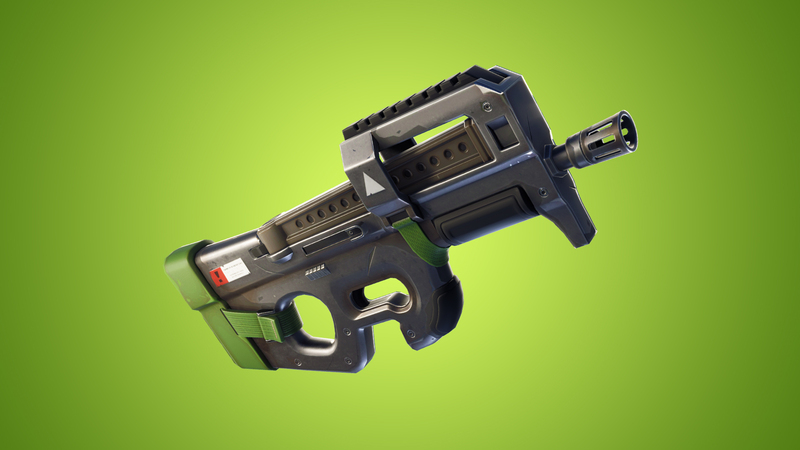 The trigger radius for the Constructor Supercharged Plasma perk has been corrected. Beetle Jess' stats now match the base Ranger subclass. New Zapper Husk enemy added! The Zapper Husk is a ranged attack enemy who fires a single, moderately powered beam at players. Damage and health for this husk put it midway between the Pitcher and the Blaster in difficulty. The Zapper Husk will be able to spawn with elemental modifiers. Be sure to check the Store daily. You never know what may rotate in! Awards past event items from Llamas and Event Store, but not from Quest Rewards. Collection book pages have been added for these items based on which event they originally were available. Many freebies and special offers will appear in the Loot tab for the duration of the Birthday event. Reduced Defender XP leveling costs by 50%. Reduced the evolution cost of Defenders by 50%. Upgrade Llamas are now limited to 50 quantity per day. Epic crafting recipe changed from 10 Nuts & Bolts to 8 Planks. No longer costs Nuts & Bolts to craft. Reduced Flowers from 6 to 4. Replaced heavy attack efficiency perk tooltips with “energy” instead of "stamina". Lefty and Righty, Founder's Revolt, Quickfire Pistol, Haywire, Haywire Storm, and Bobcat no longer snap up and down when shooting. Gold reward doubled across all Horde reward tiers. Perk Combobulator resource rewards increased +50% across all Horde reward tiers. Removed the "Loot Llama" quest. Homebase Storm Shield Defense 1 now grants Constructor Leadership. Kyle Constructor and Hero XP quest rewards are now granted by Homebase Storm Shield Defense 1. Updated Founders quests to require Homebase Storm Shield Defense 1 to be completed instead of Loot Llamas. Updated Quest text to reflect this update. Removed Copper Knight Shotgun quest reward from Homebase Storm Shield Defense 1. Updated the Stonewood quest map to reflect that the Loot Llamas quest has been removed. Removed first Loot Llama quest requirement from Constructor Leadership node. Player input for jumping is now the same as Battle Royale. It is no longer needed to hold down spacebar while jumping to reach max jump height. Fixed an issue that could cause players to become stuck on the Loot Llama Tutorial quest. Fixed issue with holding down O or B on a gamepad on the Horde Deployable Base would open the UI for the Base, instead of casting Hoverboard or editing any nearby walls. Changed elemental enemy callouts before encounters to use the correct images. Fixed issue with not taking fall damage when on the Hoverboard. Power 100 Horde Challenge Quest has been renamed to Power 76 Horde Challenge. This was purely a visual issue and the difficulty hasn’t been altered. Fixed the number of normal AI staying too low for the entire wave of Mini-Boss horde waves. Fixed an issue where some Horde hexes were giving Horde Skill Points that were one tier lower than intended. Fixed an issue that caused there to be one fewer Mission Alert on the Horde map than intended. Fixed an issue where the menu music wouldn’t repeat after leaving a game lobby. Added keyboard key prompt for the Decline button of the recycle/retire dialog box. Corrected the tooltips for Tactical Practiced in Combat and Tactical Assassination perks. Updated the tooltip for Wild West Soldier Practiced. Fixed issue with tooltips where weapons could show double the amount of damage they actually do. Fixed an issue with certain areas not playing water visual effects while running or jumping in water. New ambient and combat music for Thunder Route 99.